Wow, five more years, and we will obtain desired individual stats. Finally, a long requested feature is added. They are no longer a small indie company, but a middle sized one? It's just a shame they took so long, because from what i know, high legend finishes aren't counted for tournament points anymore, so right now they are literally useless for pro players. It is more a shame that people like you still be flaming when blizzard finally listens to the community and adds Features. How am i flaming them? I'm happy they added something that people wanted for a while, but just said the timing is bad. My message didn't even have any negative meaning. I meant that the high legend finishes are useless for pro players, not that the leaderboard is useless, if that wasn't clear. There are people literally saying stuff like "it only took them 5 years" or just asking for new features without appreciating this. Why am i the one getting blamed for flaming them? I'm so confused. EDIT: I didn't mean this in any kind of negative way. It's great that they are adding awaited features, i'm happy. The only problem is the timing, am i not allowed to point any flaws with what they are doing? People saying it only took them 5 years are getting upvoted ... Or maybe it was the cheerful joke i made (which usually gets upvoted on this site)? What i meant is that they are improving. Why all the downvotes? congrats to Paljuha and iprkolo, great players from my region (Croatian and Serbian player, respectively) for making it on there! how is there not a news post about the fact that a lot of people can't connect to Blizzard/hearthstone for more than 12 hours? This is truly an amazing feature and although it's long overdue, I'm still grateful Blizzard decided to implement this. Thanks Team 5! 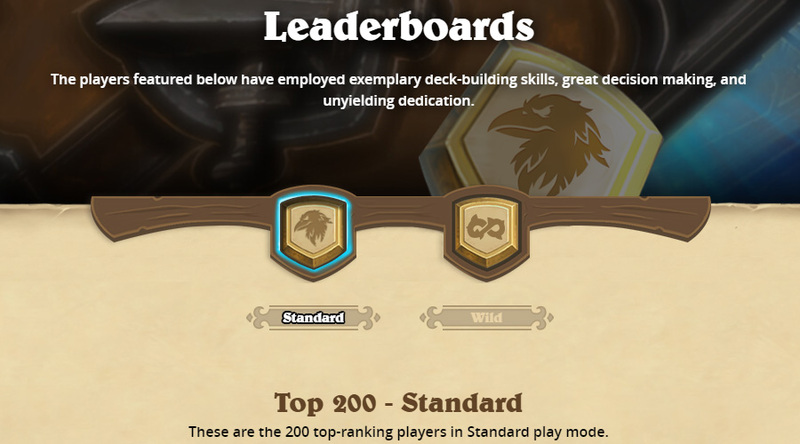 If you click the wild listing, it only has 54 but still says top 200. Weird. The season has only just started. There will be 200 by the time it's over, don't worry. Only took them about 5 years.. I only recognize a handful of pros. I wonder why they never did this sooner ?